The Cruzer 6 Face is, as the name suggests, the ultimate tool for all kinds of male grooming. It allows you to shave, style or trim your beard in one handy tool. The default state of the unit is shown in the image. As a shaver, you clip off the plastic comb, and expose the wide shaving head. Much like the Braun series 3 shaver we reviewed a little while back, this works both for wet and dry shaves, though I would definitely recommend using this one for a wet shave for added comfort. The shaver is wide, which means it covers a bigger area, and hence allows you to use less strokes, making the experience that little bit more comfortable. I did struggle to clean off the very top bits of moustache, but that is not a problem because you have the added dimensions to this. Using the styling precision trimmer on the back, you can easily clean those off. Next up is the trimmer, which is exposed on the back. To get it to work, you push it up, and the adjustable lengths mean you have a choice of 1.2, 2.8, 4.4 or 6mm lengths, meaning you can have that weekend look, the stubble, or a goatie or a trimmed beard, all in one tool. Once again I found that this works very well, both under and out of the shower, though I’d recommend using this one on dry hair, as the wet hair tends to stick together, and you don’t get as much of a neat look as you’d want. This tool doesn’t stop there, as for the bits and pieces that you may have missed, or for the gentleman who wants to pay attention to detail, you can use the precision trimmer on the back. This lets you define lines and edges, and give you those tight curves that make you look good. Other features include the fact that it can be used in both dry and wet conditions (already mentioned), lasts an hour on a charge, and the supplied charger works anywhere in the world. If you want a one tool does it all kind of a tool, this can pretty much deliver what you want. Maybe a clean shaven look isn’t your thing. Maybe you support a beard, or a stubble, and that is how you role. This one is for those people. A very simple tool, that comes with two attachments, one to let you trim your beard any where between 1, 3, 5, 7, 9 or 11 mm, while the hair clipper attachment allows you further six settings between 10 – 20mm. The clippers once again feature a clip and lock mechanism, so you know that the length you’re getting is what you’ll get all over. This means that not only can you use this for your face, but also your head, if you are so inclined. Obviously, the clue is in the name. The trimmer is also equipped with a powerful battery system meaning that it is easy to trim even coarse hair and tough beard. Since I am in possession of them, I can give you my seal of approval! Once again, the product doesn’t quite end there. This too comes with a styling precision trimmer on the back, allowing you get those tight lines, curves or edges you’d like to support. Like the Cruzer 6 Face, this also allows you to use this under a shower, or dry, though as I stated above, I found it to be more useful in dry conditions for the beard. Especially designed for body grooming, the trimmer comes with fine teeth. This minimizes nicks and cuts, and it comes with an extra sensitive comb for improved safety for the sensitive areas. Three different combs allow you to choose between 0.6mm, 3mm, or 8mm. This is not only handy for your body, but for someone like me who has sensitive skin on their face. The Braun Cruzer 6 Body actually packs in a Gillette Fusion head to give you 5 specially aligned blades for that comfortable shave. Once again, it has been specifically designed to be used on the body, and it offers you maximum shaving comfort with minimum skin irritation. Probably the most clever use is where you can trim and shave in one go. Yes, the trimmer trims your hair short before you actually shave it off with the Fusion head. This means that you can do the whole business in one clean swift stroke. 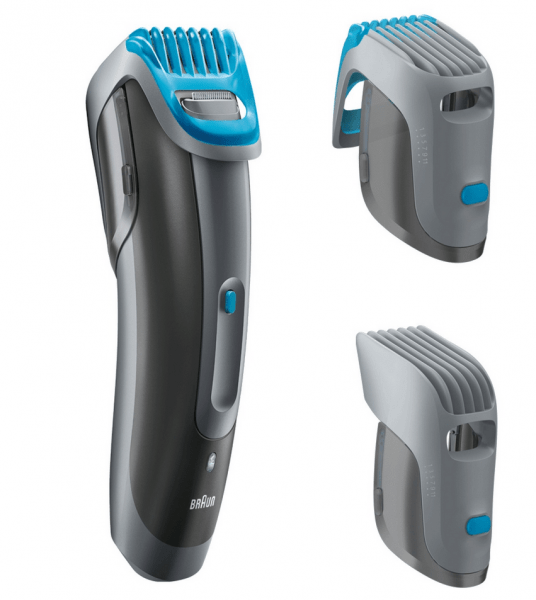 The shaver, apart from its functionality, also features a good design to help you reach all parts of your body. A very interesting tool, and specially the fact that it can do everything you’d want from a trimmer/shaver! This one reminds of my university days, where one of our friends used to use a cut-throat razor, giving himself all these elaborate designs. He truly considered his face a canvas, and every now and then we were greeted with a new complex look. While cut-throat razors are hard to get, and as the name suggests, not very safe to use, there is still hope for the likes of him and the stylish among us. The Cruzer 6 Precision allows you to reach those areas which are hard to get to, and the unique shape lets you trim off in a style you’d be proud of. It also gives you 5mm and 8mm trimming combs, meaning this can also be used to adjust things like moustaches or side burns. You can even trim your eye brows! Like the whole range above, once again this can be used on a wet shave, and can be cleaned under running water, making it very handy to use. The whole range can be bought from various retailers all over the country, including the likes of Boots, John Lewis, Debenhams, as well as online retailers.